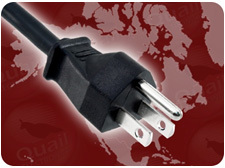 Quail Electronics is a Worldwide Supplier of power cords based in Livermore, California. 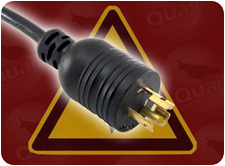 For over 25 years, Quail Electronics has delivered top quality power cord components at competitive values. 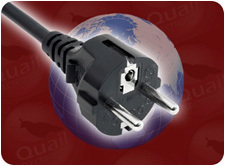 Quail stocks over 1 million standard power cords, and has the most comprehensive in the industry. North American Cords are standardized by the National Electrical Manufacturers Association (NEMA), and range from the standard 3 pronged plug you have in your living room to the large plugs used across multiple industries. North American power cords carry UL, C-UL approvals, meaning every aspect of production is licensed, and every order of our premium power cords meets the utmost requirements of our customers! Our North American Power Cords come in a variety of attractive colors and angles. Also, the length of different part numbers vary, allowing you to choose the correct distance you need. As UL Approved electrical components, Quail’s Hospital Grade NEMA Cords conform to the stringent guidelines required for Hospital Environments. 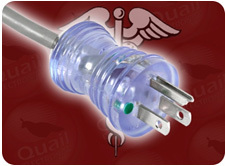 To show that these plugs meet all UL, C-UL requirements for Medical Grade Power Cords, Quail’s Hospital Cords proudly display the Green Dot Marking. The Green Dot Stamp denotes a power cord meets or exceeds requirements for grounding, current leakage, and construction quality. Most popular among Hospital Grade Cords is the 0310 series, which has a Green Dot NEMA 5-15P to an IEC C13. It even come in our new C13 Auto-Lock. Global markets require different plug styles and electrical ratings in order to safely power devices. To make navigating the many standards easier, Quail created the International Cord Locator. Using this clever tool, you can search for your country of destination and the Cord Locator will display local voltage and accepted plug type. Of the 14 International Plug Types, Quail offers many different variations on color and angle! As an additional service, at the Item Detail Level for each Part Number, we list every country where that power cord is accepted. We even have International Hospital Grade Power Cords. IEC stands for International Electro-technical Commission, and is the regulating body for power cords used with computers and networking equipment. There are many types of IEC plugs and receptacles, and they are specific by amperage, voltage (electrical ratings) and by approval issuance (country compatibility). 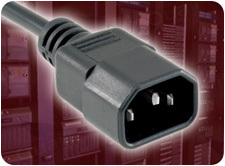 Some IEC power cords are perfect for North American networking applications, while other IEC power cords can be used across country lines because they are Universal IEC Power Cords with multiple agency approval. Our IEC Power Cords come in many colors and all different lengths. Also called Heavy Duty Power Cords, Quail’s High Voltage/ High Current Cords deliver max amounts of electricity to your components. Perfect for equipment that requires extra electrical draw, you can count on Quail’s heavy hitters to maintain premium performance and extra-sturdy construction. Look in this section for Locking NEMA Power Cords (Twist Lock), 250V Power Cords (220 V~), 125V Power Cords (110 V~), and IEC-60309 Cords (Commando Plugs). 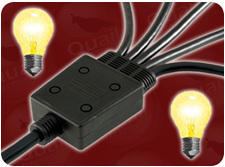 Browse the tons of Heavy Duty Power Cords Quail offers to find the model you need! Quail offers a number of power cords that have unique features. First, there are Multi-Leg Power Cords which include Y-Cords, W-Cords, and 4 or More Leg Cords. Next, Quail offers the Triple Tap Receptacle which is very popular. Thirdly, we have the Piggyback Configurations, which plug your device in, but keep the outlet available. Then, there are the Quick Release Power Cords that feature a convenient quick-disconnect lever. Finally, Quail carries the Fan Plugs that are important for powering server fans. Quail carries a broad array of products from Adapters to Plugs and Receptacles to Bulk Wire and more! Ranging in use from charging smart devices to powering international networking equipment, Quail Adapters offer precision construction for electrical interfacing. Whether configuring a server room for optimal performance or on a jobsite, you will find that Quail offers the highest quality components. All our adapters are categorized in the following groups: USB, Multiple Tap, Double Output, Single Output, and Universal. Next time you need an adapter, turn to Quail first! Quail Electronics offers a wide variety of multi-purpose Power Strips. From the Hospital Grade Green Dot Power Taps (UL1363) to the Rotating Power Strip, Quail offers only the best Power Strip products. Also, consider our International Power Strips, our Universal Power Strips, and our North American Power Strips for your bulk Power Distribution needs! Quail offers all types of hardwiring Plugs and Receptacles, from Inlets and Outlets that snap in to the back of a CPU or server to plugs and receptacles used for high-fidelity operations. We carry all types of Bulk Wire, with varying gauge, number of conductors, jacket type and color, etc. We even have Shielded wire, and can provide entire reels of Power Cabling in either North American Color Coding or International Color Coding! Quail’s Cable Retention Systems provide a dependable means for securing your power cord to the application with only minimal modifications. There are two types of Cable Retention Systems we offer: Retaining Clamps and Safety-Locks. Retaining Clamps are permanent because they require tools to undo, while Safety-Locks are semi-permanent because they can be undone by hand. For years, Networking and Medical Professionals have strived to find solutions for cable retention. Quail Electronics is proud to introduce the Auto-Lock™. The Auto-Lock™ is an internal retention mechanism that actually hooks to the pins of power supply inlets and resists any axial force unless the Auto-Lock™ mechanism is released! Stop wasting time and space carrying multiple charging adapters and looking for a place to plug them in! Quail’s unique USB Travel Power Station and USB Power Plate do the hard work for you, whether on the road or in the convenience of your home. These quality lines of smart device chargers feature USB 2.0 charging docks that supply 2.1 Amps of electrical current to charge your device. This output is perfect for any USB powered electronic device! Our Hospital Grade Power Strips are green dot approved and come in a variety of different lengths and configurations. They also come in the 4 outlet and a 6 outlet size. The Rotating Power Strip by Quail Electronics is the number one solution for saving space, especially when dealing with bulky adapters and chargers! 6 swiveling outlets have a 180 degree range of motion to allow you all the room you need for your electronics! There are 2 lateral fixed outlets, and all together the 8 sockets are rated for 1800 Watts of workload!